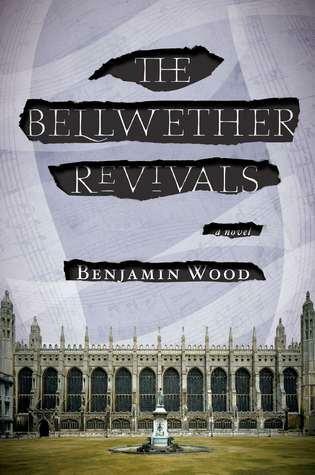 The Bellwether Revivals from British author Benjamin Wood starts off explosively with “the caterwaul of sirens,” “blue lights,” and three bodies. One of the three bodies–a man who’s “still breathing, but faintly,” is named while the other two are not. Activity swirls around these three bodies about to be taken away by ambulance, while another character, Oscar, smokes and other unnamed people “bicker” about blame and guilt. Something terrible has taken place, and then the rest of the novel goes back in time and leads back up to this event. The main character of the novel is Oscar Lowe, a twenty-year-old care assistant at the Cedarbrook nursing home. Oscar enjoys his job, and even has a favourite patient, Dr. Paulsen, a former English professor who struggles to maintain his dignity in the nursing home by keeping some distance from the other residents and the management’s degrading schedule. The former educator in Dr. Paulsen recognises that Oscar is intelligent and underemployed, and he takes a personal interest in Oscar, lending him books from his library. Due to an absence of parental support, Oscar was unable to attend university, and yet here he lives in Cambridge, a university town surrounded by people his age who are fortunate enough to have that option. One night, on his way home from work, cutting through the grounds at King’s College, Oscar is drawn to stop and listen to an organist playing within the chapel, and it’s here he meets Iris Bellwether, an attractive medical student and her charismatic brother, Eden who is the organist. Oscar is swiftly drawn into the world of the privileged Bellwethers, and as someone who works for a living–and humbly at that–Oscar’s position as the only person in the Bellwether’s circle who is not attending university is, at times, extremely uncomfortable. They were the kind of sophisticated people his father never let him be friends with when he was younger–‘the high and mighty crowd,’ his father called them, the ones who lived in the detached houses out in Cassiobury. Oscar would see them in the wing mirror of his father’s van, wandering home from the grammar school in their smart black blazers; the kids whose parents his father built extensions for, but with whom he was too proud to share a cup of tea after a day’s work, fearing their good crockery and their vast, expensive kitchens. Now here he was, holding his own amongst the same type of people. One school story was regaled with another, and for the first time all night, Oscar began to feel genuinely excluded. He was drawn to the urbaneness of their lives, their refinement and culture, but he just couldn’t find a way into their discussion no matter how hard he tried to interject. They were pulling memories from a private source, from some reservoir of experiences, they’d all shared. The fact that Oscar is enamoured with the Bellwether’s lifestyle and rapidly falls in love with Iris explains why he starts taking no small amount of crap from Eden. The inclusion of the word “revivals” in the title gives a clue to the substance of the novel. Eden believes that he is a faith healer of sorts and he claims to ‘heal’ through hypnosis and the power of music. The difference between Eden and let’s say Aimee Semple McPherson is that while the latter drew large audiences, Eden’s audience is his intimate circle of friends, and that circle now somewhat uncomfortably includes Oscar through his growing relationship with Iris. The Bellwether’s intimate group of friends (Marcus, Yin, and Eden’s girlfriend, Jane) who are “like a family” find Eden to be charismatic, compelling, and they very consciously and unhealthily yield a leadership role to him, yet privately Iris expresses concerns about Eden’s mental health and asks Oscar to help her gather proof that her brother needs psychiatric help. Gradually Oscar finds himself drawn deeper into the Bellwether’s circle, and rather interestingly, Oscar’s other life–his life at Cedarbrook begins to connect with Eden’s shady activities. In order for the novel to work, it’s essential that Oscar’s continued involvement with the Bellwethers is believable. I had a slight problem with this as I would have cut and run after the first night, but Oscar, in spite of strong reservations about Eden’s insufferable behaviour, goes back for more. This is explained by three elements: Oscar’s relationship with Iris, his attraction to the Bellwether’s cachet and finally the much more complex reason that there’s an appeal to his ego–Oscar’s involvement with the Bellwether circle and his quest to help Iris takes him beyond the boundaries of his routine at Cedarbrook. Blurbs for the book call The Bellwether Revivals “part Secret History, part Brideshead Revisited.” I haven’t read the former, although Kevin From Canada has, so read his review here. I have read Brideshead Revisited and a comparison to Evelyn Waugh’s book will, I think, set any potential readers on the wrong path. Certainly there are echoes of that sort of moneyed privilege which brings forth a sense of utter righteousness, but that’s about as far as it goes. The truth was, Oscar wasn’t sure if he liked her parents at all. They had that impossible confidence that comes from wealth, the self-righteousness that comes from piety. How many times had he spoken to Ruth Bellwether, only to have her blinking back at him silently, showing no sign that she’d even been listening. While Oscar’s continued involvement with the Bellwethers is believable, the book is light on its treatment of the other people in the group, so consequently these characters feel contrived. Not too huge a problem but with the insufferably arrogant Eden acting as a centripetal force on the small “flock” (as the circle is called), some extra explanation of the character weakness of the others involved is necessary. Since the story opens with its ending, the emphasis is not on what happened, but how it happened, how events went as far as they did, and whether this train wreck could have been prevented.